This is the best crock pot pinto beans recipe. You can also use black beans. I use it for a lot of recipes like refried beans or Cafe Rio Salad. 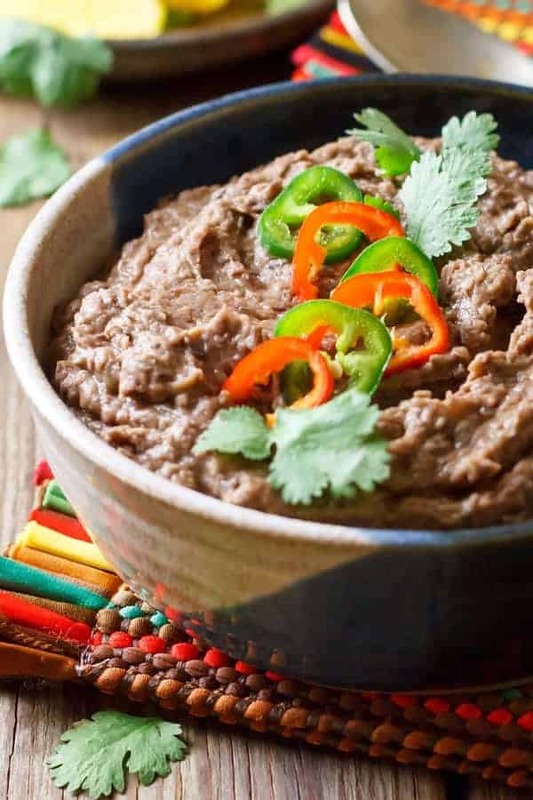 I really think this is the best crock pot pinto beans recipe. They taste so much better than canned pinto beans and are so versatile. 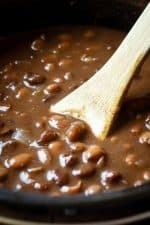 This best crock pot pinto beans recipe works with all sorts of beans and you can always choose to not blend them into refried beans and just eat them as plain beans. I make this same recipe a lot with black beans and then freeze them in little individual freezer containers like these before I blend them. They unthaw in about 10 minutes and are perfect to throw in taco salads, soups, burritos, Cafe Rio Salad, etc. My 8-year-old daughter LOVES beans. It’s a pretty big obsession she’s had for years. It’s really weird. It’s probably because when I was pregnant with her I ate a lot of them. It could also explain why my 5-year-old daughter won’t eat anything with dairy except pizza – because I was on a no-dairy diet when I was pregnant with her. Just a theory, but I think it’s interesting. Anyway, my 8-year-old daughter loves to eat these plain, although I’m not sure that means anything because at the store the other day she chose baked beans over fried chicken – so I think she’s a little biased. I love to use these in my Cafe Rio Pork Salad Recipe with Creamy Tomatillo Ranch Dressing . They really do taste good and pinto beans are so insanely cheap when you make them yourself and they can really stretch your meat. My friend mixes half black beans and half crushed black beans in lots of her recipes to save money on ground beef, add flavor and save money. You could also merge this recipe with this Best Healthy Smoky Vegan Black Bean Soup and turn this into a really good soup. Please let me know if you try my best crock pot pinto beans recipe. I would love to know which type of bean you use and if they turn out as well for you as they do for me. These are insanely easy to make and taste tons better than canned beans. I love to make a big batch of whatever kind of bean I am in the mood for and then freeze them in individual portions to eat later. I “refry” them after I unthaw them, so I can use the beans whole if I want. Combine everything except the water in a slow cooker. Drain the beans, saving the liquid. Transfer the beans to a large bowl. Optional – Beat with an electric mixer on medium-high speed until creamy, 3-5 minutes. Add some of the reserved liquid if needed to make them more creamy. Have to say, thank you so much for this recipe! I used all 3 cups of black beans and soaked overnight then rinsed then followed everything else (had to soak and rinse because I have stomach issues and apparently best if soaked and rinsed), anyways, I am going to use these in so many other things. In wraps, on a vegetarian eggplant parma it is soooo tasty so thank you very very much. You’re so welcome! I’m telling you that this recipe can be life changing. Seriously. Frozen little containers of goodness. Hi! Thank you for sharing your recipe. Question; do you soak your beans overnight prior to making the crockpot recipe?